Discover an easy baby hat knitting pattern amid the sea of patterns for newborns. Red Heart Yarn's Easy to Knit Sweet Baby Hat knits up quick and keeps baby's head warm. It's a great gift idea for a shower or child's birthday party. 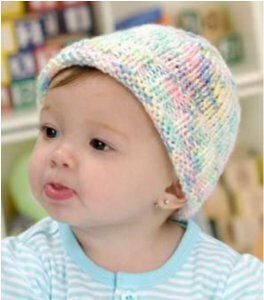 The cute colors in this easy baby hat pattern make it a real standout. Little ones will never fuss when they're out in the cold, and moms and dads will appreciate the quiet. Even when the wee one grows out of the hat, parents will want to save it as a keepsake. Gauge: 16 sts = 4 inches; 23 rows = 4 inches in St st. CHECK YOUR GAUGE. Use any size needle to obtain the gauge. Directions are for size Preemie; changes for size Baby are in parentheses. Hat Circumference: 12 inches (14 inches). Row 1 (Right Side): * K2, p2; repeat from * across. Repeat Row 1 for K2, p2 rib. Work in K2, p2 rib for 1 (1½) inches, end by working a wrong side row. Begin St st with a k row, and work even until piece measures 4½ (5½) inches from beginning, end by working a wrong side row. Row 1: * K6, K2tog; repeat from * across–42 (49) sts. Rows 2, 4, 6, 8, 10, and 12 (Wrong Side): Purl across. Row 3: * K5, k2tog; repeat from * across–36 (42) sts. Row 5: * K4, k2tog; repeat from * across–30 (35) sts. Row 7: * K3, k2tog; repeat from * across–24 (28) sts. Row 9: * K2, k2tog; repeat from * across–18 (21) sts. Row 11: * K1, k2tog; repeat from * across–12 (14) sts. Cut yarn, leaving an 8 inch tail. Thread through remaining sts, pull tightly to secure. Sew back seam. Weave in yarn ends. If you like to make free knit hat patterns for babies, then you'll fall in love with our free eBook, 39 Free Baby Knitting Patterns. In this printable collection, you'll find patterns for baby booties, tiny sweaters and cute baby blankets. These patterns are warm, cozy and so much fun to make. Give your creations to a new mommy or save it for a little one's birthday. Whether you want to learn how to knit a hat or consider yourself to be a knitting expert, this collection is sure to become a favorite. I like this pattern a lot and it looks pretty easy. Will try this one!